I've long been fascinated by "portals" and they have often figured prominently in my work. For this scene I used The Plant Factory to model the "gateway" and then used my "Core World" render as the "destination". "Gateway from the 2017 gallery"
A portal to one's imagination. This rendering draws one's third eye to the center and beyond. Should I? What a dilemma. Where would it lead? Great work, with many questions. Love this, Ryan. 'Sgot that Alice in Wonderland feel goin' on. 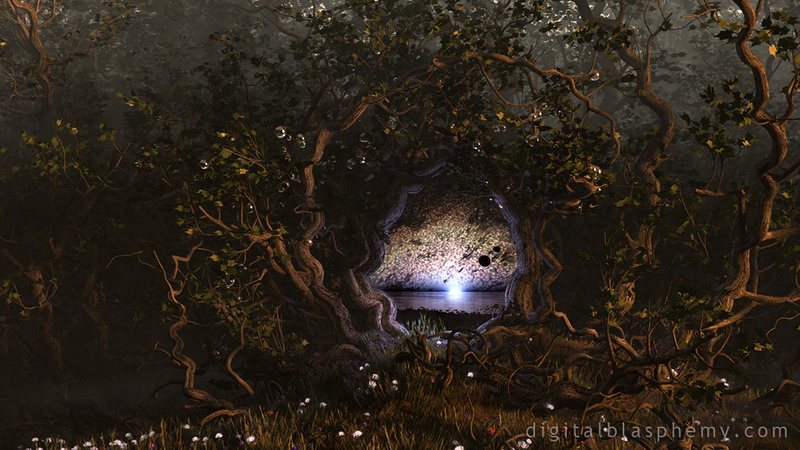 "Faerie worlds on other planets"
This has just become my new all time favorite Digital Blasphemy wallpaper. Just stunning. Thank you! I like this one and I also like your Pickle Jar variation - the portal is opening to different worlds. "In this case the Cake is NOT a Lie"
I can imagine a druid conjuring this portal and the trees winding together to form the portal. Great job, one of my favorites. This is great. I mainly love your art for its aesthetic value, but something about the magical portal makes this one really stand out. Many of my favourite works of yours are the most original ones: the ones you could easily distinguish from all your others with a word or two. "The one with the dragons." 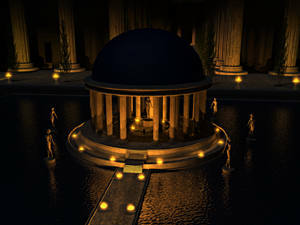 "The one with the water maze." "The one with the portal." Wallpapers like this are the stuff of imagination. I've been a DB fan almost since the beginning. It was images like this that kept me coming back and ultimately become a lifetime member. 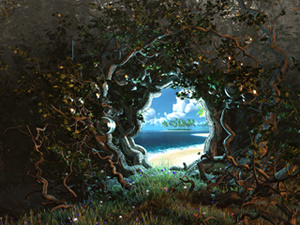 I love that this image allows x2 of the imagination power that your typical wallpaper exudes. You have a gift of drawing the viewer in. Do more like this! Thanks! I adore this one, and the picklejar render is almost as good. They're both magical. I can see us taking many more journeys into your imagination via this gateway. Thank you, Ryan! "Makes you wish you could walk right in." It looks like something I'd imagine from Middle Earth..
You hit the nail on the head speaking of portals, the ultimate being the City on the Edge of Forever from Star Trek. Love this stuff and the imagination that it inspires thinking about "that step" from which there is no return...your image doesn't look right at first, but upon really examining it, it's just the mind adjusting. I love pieces like this that make the imagination tingle. Excellent job Ryan. Nice work, Ryan. I'm crazy about the idea of portals, too. I love everything about the foreground. It feels like a rich dense painting. My only quibble is with the destination. I wish it was more inviting, with peaceful cool colors. But it is still going to be on my home laptop and at work. This render has a certain hand drawn quality to it that makes it both charming and fascinating. It really draws me in, as though it were an illustration from an old childhood story. I normally stick to the planets and space renders, but this really drew me in. Well done! Take a walk through the thorns of the forest and emerge in a new but different landscape. Well done image. "Welcome to the next level"
This is absolutely amazing. It looks more like a painting than a digital rendering. It has a fine art feel in the look of the trees. Truly one of your best works to date. Totally worth the wait. Oh this is great! I love the twisting of the small trees and branches to create touch of natural to the magic. It would be amazing with winter coming to see a variant where it is snowy and cold in the foreground, but the land beyond is bright and blooming like your Sakura wallpapers. Waiting anxiously for the multiscreens. Love the fantasy aspect of this render, as well as the Si-Fi side, as we look on to the other worlds. Fantástico. This render definitely gives off the Fairytale vibe. Great job Ryan!! !